Blue Jays are among the most handsome of birds and are renowned for their cleverness and raucous voice. They have unjustly gotten a bad reputation for raiding the nests of other species possibly because John James Audubon illustrated them in the act. While Blue Jays are not innocent of such an offense, birds and eggs make up a tiny portion of their diet. Blue Jays are, however, very aggressive toward potential predators and frequently mob hawks, large owls, snakes, raccoons, cats, and even humans that venture too close to fledged young. Blue Jays breed from southern Canada across the eastern United States. They are partially migratory with some individuals remaining throughout the year, while others migrate to the southern portions of the range. 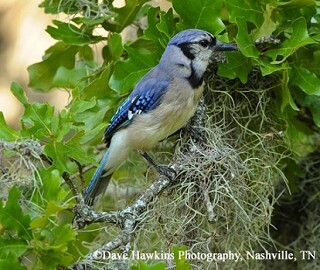 In Tennessee Blue Jays are year round residents with more northerly nesting jays joining the local population in winter. Description: The Blue Jay is blue above, grayish-white below, has a prominent blue crest, and a bold black "necklace" across the chest. The male and female look similar; the juvenile (May-August) is duller. Voice: The Blue Jay makes a large variety of sounds including a shrill descending jaaay, a repeated jay jay jay, a whistled-warble toodali, clicks and rattles, and is an expert at mimicking the call of the Red-shouldered Hawk. No other bird found in North America has a blue back, blue crest, and a black "necklace" across the upper chest. This is the only jay species found in Tennessee. Habitat: Found in deciduous, coniferous, and mixed forests and woodlands, more along forest edges than in deep forest. They are also common in urban and suburban areas, especially where large oaks are present. Diet: Arthropods, acorns and nuts, fruits, seeds, small vertebrates. Blue Jays frequently visit birdfeeders. Nesting and reproduction: In Tennessee, Blue Jays begin courtship in late winter; peak egg laying is in late April, and pairs will frequently raise two broods in a season. Clutch Size: 3 to 5 eggs, range to 7 eggs. Incubation: The female does most of the 16 to 18 days of incubation with the male providing her food. Fledging: Chicks fledge in 17 to 21 days. Fledglings begin foraging for themselves within 3 weeks, but may be fed by the parents for another 2 months. Nest: The female does most of the nest building, which takes 3 to 5 days. The nest is an open cup of twigs, grass, and sometimes mud, and lined with rootlets. It is typically located in the crotch or outer branches of a deciduous or coniferous tree. Nest heights range from 5 to 50 feet above the ground. In Tennessee, the average nest height is 18 feet. Status in Tennessee: The Blue Jay is a common and conspicuous permanent resident. Flocks of migrating Blue Jays can often be seen in fall (mid-September to early November) and spring (late March into early May). Breeding Bird Survey data show a slight, but significant decline in Blue Jay numbers in Tennessee and rangewide. Reasons for the decline are not clear. Much about Blue Jay migration is still a mystery. Evidence indicates that young jays may be more likely to migrate than adults, and some adults migrate south in one year, stay north the next winter, and then migrate south again the next year. Blue Jays are especially good mimics of Red-shouldered Hawks. It is not known if they do this to warn other jays of a hawk's presence or to fool other species into believing a hawk is close by. The blue in a Blue Jay's feather is not from pigments, but is the result of light refraction within the internal structure of the feathers. If a Blue Jay feather is crushed, the blue disappears as the structure is destroyed. The oldest know Blue Jay in the wild was 17 years 6 months old! Best places to see in Tennessee: This species can be found in a variety of forested landscapes in every county of the state. Tarvin, K. A., and G. E. Woolfenden. 1999. Blue Jay (Cyanocitta cristata). The Birds of North America, No. 469 (A. Poole and F. Gill, eds.). The Birds of North America, Inc., Philadelphia, PA.